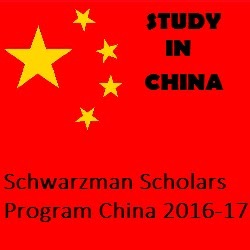 Schwarzman Scholars Program is offered MS degree scholarships for international applicants at Tsinghua University in Beijing, China. Designed to prepare the next generation of global leaders, Schwarzman Scholars is the first scholarship created to respond to the geopolitical landscape of the 21st Century. Enrolling the inaugural class in 2016, the program will give the world’s best and brightest students the opportunity to develop their leadership skills and professional networks through a one year Master’s Degree at Tsinghua University in Beijing one of China’s most prestigious universities. The class that begins in summer 2017 will include 125 scholars, and the program will grow to include up to 200 students in coming years.